The Tennessee Supreme Court has recently thrown open its courthouse doors wider. Starting on October 3, Supreme Court oral arguments taking place in Nashville will be videotaped and made available to the public. In a typical case, lawyers for both sides first file extensive written briefs to the Court. During oral arguments, they are given a set time to argue their positions, with the justices interjecting questions throughout. After review and discussion, the Supreme Court then issues its decision. The addition of video adds to the Supreme Court’s robust outreach and education programs. The Court’s SCALES program was awarded the prestigious Sandra Day O’Connor Award for the Advancement of Civics Education in 2016. The program was started in 1995 and is designed to educate high school students about the legal system and the appellate court process. The Supreme Court travels to several different locations throughout the state each year and holds court in local communities before hundreds of high school and college students, who have been prepped in advance with visits from local attorneys and judges. To date, over 33,000 Tennessee students have seen an oral argument live through the SCALES program. The video system includes three separate cameras, allowing the view to toggle between the attorney at the podium and the individual justices on the bench during the oral argument. The cameras are operated from a control room that was built behind the historic court chambers, which date back to 1937. The building is listed on the National Register of Historic Places and currently does not have the technical capacity to allow livestreaming of events such as oral arguments. Tennessee Supreme Court oral arguments also take place at the Knoxville Supreme Court Building, which is also on the National Register of Historic Places, and the Jackson Supreme Court building, which is currently undergoing renovations. Once technical modifications can be completed at those locations, the goal is to place cameras in those courtrooms that can be controlled by the single control room in the Nashville building. These are not the first cameras to enter Tennessee courtrooms as the Tennessee Supreme Court was an early adopter of rules that allow media video cameras and still photographers in courtrooms statewide. The Supreme Court of the United States and several states still allow no, or extremely limited, media access to the courts. In the past year, several trials, including the two-week trial of Zachary Adams for the murder of Holly Bobo, have been livestreamed from Tennessee courtrooms on multiple media outlets worldwide. The video of oral arguments will be available on the tncourts.gov website 21 days after oral argument. Documents related to cases before the Tennessee Supreme Court are available on tncourts.gov under the Public Case History, which receives nearly 200,000 page hits a year. In total, the tncourts.gov website receives over 5 million page views each year, almost all from Tennesseans. 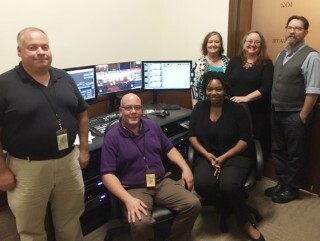 The AOC IT team in the control room built off the Supreme Court's historic courtroom in Nashville.